Home Kabeefo Barrow’s CabinetReshuffle: Causalities, Survivorsand Reasons You Never Knew. Frank Underwood in the NETFLIX seriesHOUSE OF CARDS once remarked: “The road to power is paved with hypocrisy, and casualties. For those of us climbing to the top of the food chain, there can be no mercy. There is but one rule: hunt or be hunted”. The president of The Gambia, Adama Barrow, has done what many felt was long overdue. Reshuffle hisunder-performing cabinetwhich has been dogged by scandals recently. Adama Barrow’s government has all the makings of a Hollywood drama similar to the highly acclaimed ‘HOUSE OF CARDS’Netflix series; where a scheming politician Frank J. Underwood after being passed over for an important government position schemed his way into Vice Presidency. Frank J. Underwood after scheming his way to Vice presidency engineered the down fall of the naïve and accidental incumbent President Garett Walker and eventually become the President after pushing out Walker from the Presidency. Weby no means equate the new Vice president Lawyer Ousainou Darboe to Frank Underwood but one thing is clear; President Adama Barrow isa naïve, unsophisticated, accidental and spineless president despite his humility and best intentions for The Gambia. The Vice President, Fatoumatta Tambajang, received her marching orders, while former veteran opposition leader and lawyer, Ousainou Darboe received the nod to replace her as Vice President. Also sacked were ministers of Information and Communication Infrastructure DA Jawo, minister of Agriculture Omar Jallow and minister of Youths Henry Gomez. The minister of Finance, Amadou Sanneh has also been moved to the ministry of Trade and regional Integration, while Dr. Isatou Touray has been re-assigned to the Ministry of Health and Social Welfare. She served as minister of Health under former president Yahya Jammeh before being fired in unceremonious fashion. She would later join the United Nations where she worked until retirement. She became a vocal critic of the former president and receives credit for cobbling together the political coalition that won elections against Jammeh in the dying days of 2016. She was named Vice President following the defenestration of Jammeh’s regime after a month-long standoff which many blamed her for causing with her unguarded comments about Jammeh in an interview with The Guardian. She seemed to be doing well and her job didn’t seem to be under any threat until recently. She has been accused of using her position to procure jobs for close family members. Her son who was until recently based in the United States was hired for an important position at the OIC Secretariat, as The Gambia prepares to host the biggest gathering of Muslim leaders in the world. Her daughters Naffie Tambajang and Khadija Tambajang have come under intense public scrutiny for their burgeoning influence in the country. Pictures surfaced online of meetings between Khadija Tambajang and the first family of Senegal which set tongues wagging. Then a video was published by US-based Freedom newspaper where she announced her desire to be president of The Gambia someday. Amid increasing calls by the UDP top brass for her sacking, the publication of the video hammered the final nail into her political coffin. 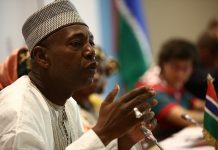 Minister of Agriculture Omar Jallow’s demise in the complex cabinet of Adama Barrow has been a long time coming. He is on public record for criticizing any possible plans that will enable the president to serve beyond three years as stipulated in the coalition agreement. Recently, he has also been mired in a corruption scandal over the sale of over 27,000 bags of expired fertilizer meant for poor farmers. Culpable or not, he didn’t come out unscathed from the fallout. He threatened to sue the media house that made the publication and his presser to clear the air raised more questions than answers. What’s more, in a case of hubris and violation of rules governing political power games, he made a public criticism of the president. He questioned the wisdom of the president sanctioning the institution of an investigation of his ministry without the courtesy of personally informing him. It was clear this wouldn’t go unpunished and more trained eyes on Gambia’s political terrain and firmament already wrote his political obituary. And so, just like the day eventually turns to night and night eventually to day; it came to pass. Minister of Youths Henry Gomez’s elevation to his position in the aftermath of the improbable coalition triumph over Jammeh was a study in political compromise and tolerance. Poorly educated and hobbled by stinging dearth of relevant experience and training for the job, he struggled to assert himself in his role. He simply didn’t possess sufficient command of his brief as minister of Youths and Sports and his theatrics and regular bungling of local and international media interviews were a source of enormous embarrassment to the government. Gomez’s alleged involvement in a plot to extort money from departments under his ministry and prior conviction for drugs offences in Germany was no aid to his already low public approval rating. What he lacked in competence, he made up for with staunch loyalty to the president. But even that, in the wake of protests and killing of three unarmed civilians during a protest in Faraba could not save his job as Adama Barrow cleans house with electric broom. He was the president of The Gambia Press Union who later moved to Dakar to work for Africa Press Agency. He was tapped to serve as minister of Information based on his reputation as a man of principles respected across the breadth and length of the country. Having no formal education in Communication, Jawo didn’t know the difference between journalism, PR, propaganda and political communication. DA Jawo didn’t know he was a mouth piece and effectively a Chief salesman for the government. He struggled to effectively sell the nascent government to the people, despite his desperate and best efforts. He was dedicated to his job, but his lack of experience in PR made the sale of government propaganda on the public mind a failed effort. His press releases and interviews came across as bland and unconvincing. Recently, a leaked letter attributed to him which he later confirmed criticizing the award of the telecommunications gate way contract without following the procurement process was a source of immense embarrassment for the government. And to make matters worse, his announcement of the appointment of Ebrima Sankareh as spokesman for the government was denied by the president’s press officer Amie Bojang-Sissoho laying bare the dysfunctional state of Barrow’s cabinet. Previous articleWhat Went Wrong With Imprests?